Chill a cocktail glass. Add the Averna, bourbon and bitters to a chilled mixing glass. Dump the ice from the cocktail glass into the mixing glass, then rim the cocktail glass with port. Pour the remaining port into the mixing glass. Add more ice and stir. Strain into the port rinse glass. Garnish with a flamed orange twist. You could say that the Beatnik is a unique Manhattan variation or more accurately a Manhattan completely reworked. 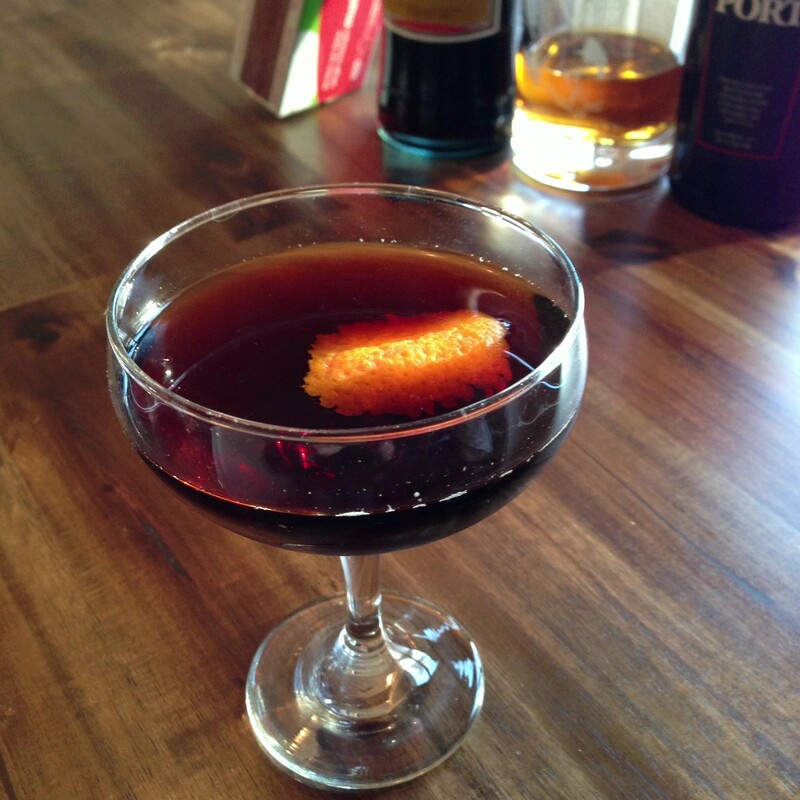 The addition of port, a seldom used ingredient in cocktails, really makes the Beatnik one of a kind and works with the Averna to take the place of sweet vermouth. Warm caramel and citrus notes on the nose. As far as the taste, Averna takes the lead, with rich smooth caramel and a hint of bitter, while the bourbon maintains a whiskey presence at the base. The port adds a sweet and savory complexity to the taste accented with bitters and the smokey flamed orange twist. The finish starts sweet and citrus with bitter flavors gradually ramping up toward the end. The Beatnik was created by Duggan McDonnell, founder of Cantina in San Francisco. McDonnell also founded Campo de Encanto Pisco, a really tasty newish pisco. I have seen a few recipes for the Beatnik. The one presented above is sort of a combination of the various recipes I’ve seen. Some recipes don’t rim the glass with port and use more port (1oz), which I found to my tastes to be a tad too dilute (since the drink is already incredibly smooth as presented above). Some call for bitters, others don’t. This is certainly one to experiment in ratios and bitters as the flavor changes fairly significantly with slight variations.